There must be thousands of public art installations in the United States, and every once in a while there is a major brouhaha over one of them. Right now, controversy is swirling around a memorial to Martin Luther King. It would be placed in the heart of Washington, DC, along the Tidal Basin, not far from memorials to four American presidents. The entire memorial will cover four acres and has a number of architectural elements (visit the website linked at the bottom of this post), but the one disputed piece is the statue representing King. It is based on a photograph showing a contemplative, philosophical King, rather than his more well-known oratorical persona. The controversy has several aspects. 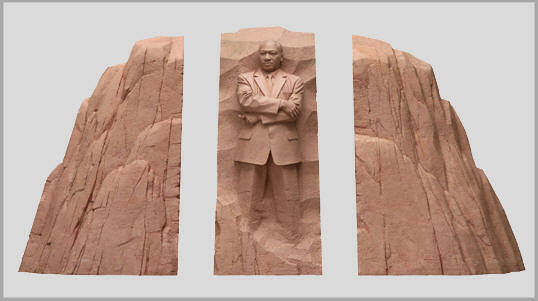 One is that the statue is being made in China, by a Chinese sculptor, from Chinese granite. Lei Yixin was found by scouts for the memorial committee during a stone-carving expo in Minnesota. 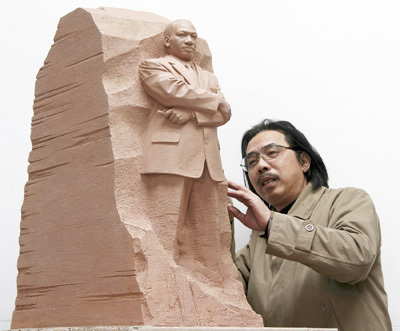 Yixin was awarded the commission to create the statue, based purely on his artistic ability and experience in carving other monuments (a booming business in China). Does the nationality of the sculptor matter? Would an American artist — particularly an African-American — do a better and more meaningful job? Or, since King fought for equal opportunity for all, should the nationality of this sculptor be considered a coup for diversity — or ignored altogether as irrelevant? Does China’s poor record on civil rights contradict the importance of what King did for civil rights in America? “Made in China” can be an especially negative phrase these days, due to outsourcing of jobs and product recalls. the pose is confrontational — or is it strong? facial expression is stern, frowning — or is he contemplating societal problems and looking forward to a better future? The side pieces are “two mountains of despair” – cracking and starting to collapse. The center is the “stone of hope” (28 feet tall). They will not be positioned immediately next to each other as shown, however (see the website, below). Quotes from King will be carved on the flat faces of the stones. Your post reminded me about the Viet Nam veterans’ memorial created by Maya Lin when she was 21 years old. Public art seems so fraught. I’d like to know how the King family feel about this too! I could not find any references on the internet, only a CNN posting that said attempts to reach the King family for comment were unsuccessful. The committee took the sculptor to various places important in Martin Luther King’s life. Yixin talked to journalists involved with King’s history, and studied hundreds of photographs. Apparently in China, people are aware of the “I have a dream” speech but not much else. I believe that during his own lifetime, when China was much more communistic politically, King was not an “approved” kind of person. So Yixin would’ve had a lot of homework to do. I wonder if the disagreement over the pose is a cultural thing — perhaps that stance has a different connotation in China than in the U.S.
Ditto Terry’s second paragraph. I think a closer connection to King and his legacy would lead to an authentic memorial. However, King’s message was not limited to an American audience, nor would we want to limit it to such. So, if the committee chose this artist based on his artistic merit, then the should suffice. It’s not like they’ve commissioned the Chinese government to create the memorial. Which leads us to the human rights issues — it’s the Chinese government who’s record we abhor, presumably not Yixin’s. America is standing in a big glass house regarding human rights now anyways (Gitmo, Abu Graib, rendition policies, etc.). If human rights are an issue, then perhaps the committee needs to find a Swiss sculptor. I’d be interested in knowing how the King family and those who worked most closely with MLK feel about the design. It always seems to me that the people most closely and personally associated to a controversial issue are the ones who get the privilege of deciding its acceptability. For me, it seems a strong statement, fitting the stature of MLK, but I don’t think that is the issue. As to the artist, I don’t care if he is Chinese. 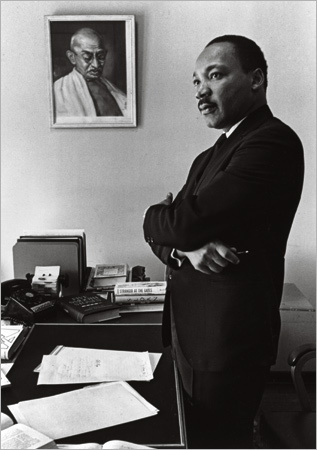 What I would care about is what his understanding of MLK and his impact and his legacy and his place in our history. I might feel better about an artist who has a true connection to the history.